This weekend, the fam celebrated Bama’s loss and Auburn’s victory in style. 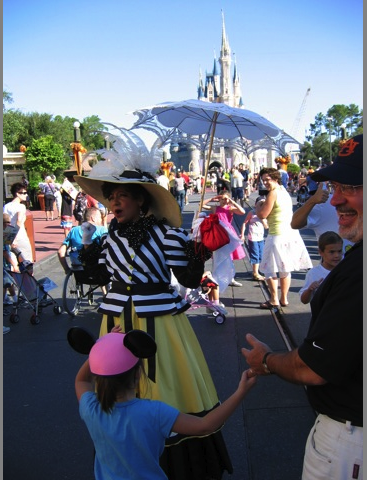 And I kid you not – the very first character we encounter upon entering the Magic Kingdom (presumably a sister suffragette from Mary Poppins) sees my hat, sees my Dad’s hat, and lets loose three booming “War Eagles”. She also spoke fluent Dutch. It was a good trip. Have you ever had the chance to see a depressed Bama fan in the midnight glow of the Monorail? It’s like Christmas. (South Carolina beat y’all with one hand tied behind their back, you codfish!) And wow, four WEMs in two days. Maybe more. But this was the first and the best. Hope they made up some “Honk if you sacked Greg” bumper stickers. Wait just a doggone minute. I am pretty sure that we were in WDW at the SAME TIME! That is weird. How did this go unnoticed?? ?